Seventh grade best friends, Caylie Jiang-Kahn, Lauren Blindell, and Sabrina Robinson have busy middle school lives. Sabrina wants to make a movie about their friendship, but a stray dog shows up and ruins the day. In frustration, Lauren curses, “Oh Phooey.” The name sticks. The crazy mutt will forever be named Phoo. Sabrina pieces together bits of the footage she shot. She highlights Phoo’s silly antics and puts the video up on a movie contest website. The video goes viral and suddenly, Lauren, Caylie, and Sabrina are celebrities at school. When a volunteer at the dog shelter sees the film, she assumes the dog belongs to the girls and calls them to come collect Phoo. The girls arrange to take turns caring for Phoo until he can be adopted. While sharing Phoo, Caylie, Sabrina and Lauren begin to notice that if the dog is around, lucky things seem to happen. The moment he’s gone…the luck disappears. When they all need the dog’s magic at the same time, it’s up to the girls to decide once and for all: Is Phoo truly a lucky dog? “I can’t,” Sabrina said, her voice tight and sad. She took a few more steps towards the van. The rain, to Lauren, seemed to be coming down harder. The drops blended in with her tears now. And looking at Caylie and Sabrina, Lauren couldn’t tell, but was pretty sure they were crying, too. “We had fun,” Caylie said. The remark caught Lauren off-guard. What was Mrs. Salinas talking about? “You don’t think he might have some kind of powers?” Sabrina looked over at Mrs. Salinas who was now at the van, loading Phoo inside. “I think maybe,” Lauren said tentatively. “I saw this show about luck and how―” Lauren stopped herself mid-sentence when she saw Mrs. Salinas push Phoo into an empty carrying cage. His voice joined the choir of barking dogs and was the loudest of them all. Rhody Cohon wishes she could adopt a million pets! Until her house is big enough she'll pamper the few she has and help others find the perfect home. Stacia Deutsch sits at the keyboard crafting stories all day and then, plays with her own crazy, lucky, dog at night. She and her three kids live in Southern California. 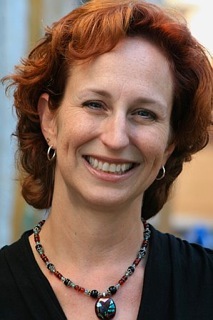 You can visit Stacia at www.staciadeutsch.com or on twitter at @staciadeutsch. Giveaway: Here is your chance to win some great prizes. Check out the list of prizes below. This sounds like a wonderful book to read with my daughter. She is almost ten but loves for me to read to her at bedtime still. It is a great way to spend quality time with her. I try to find interesting and fun books to share with her.